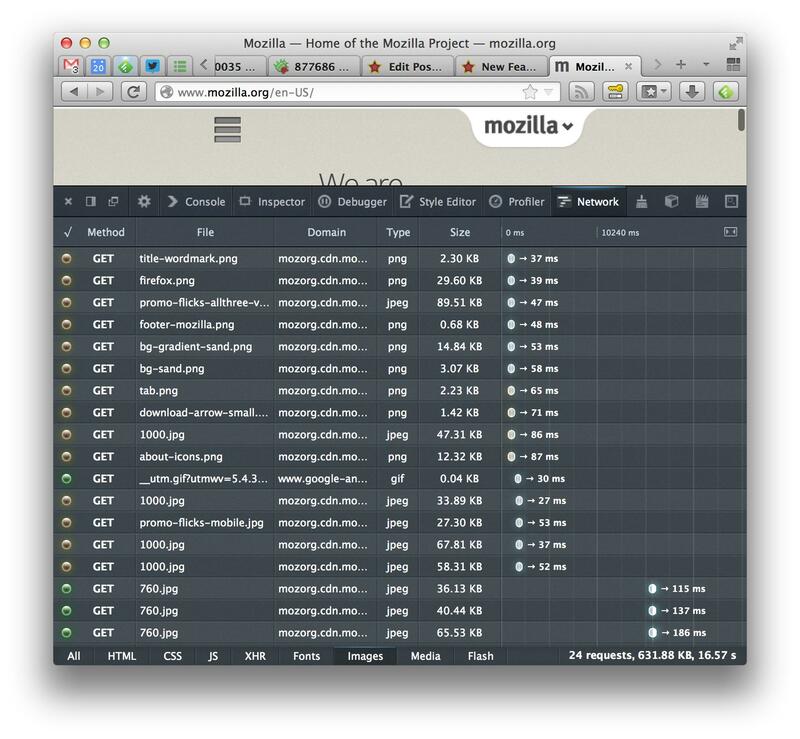 Releases have recently rolled, and there are a slew of new features coming to the developer tools in Firefox 24. Firefox 24 is currently in our alpha channel Firefox Aurora, and will hit the main release channel on September 17th, 2013. A little alitteration leads to lots of cool features coming this release. I’m only touching on a few highlights here; to see a comprehensive list of all the new changes to developer tools, check out the full list of bugs fixed since last release. An oft-requested feature, the console will now clear all of the existing logs when you refresh the page. If you need logs to persist across reloads, don’t worry: this behavior is toggle-able in the options panel. Here’s to less clutter! Users were also reporting that the “clear” button was confusing. It wasn’t obvious whether it was clearing the logs or the the filter text because the button as adjacent to the filtering search box. We moved it to so that this won’t happen anymore! sourceMappingURL=... rather than the deprecated //@ sourceMappingURL=.... We will still respect the old style, but will warn you that it is deprecated. Here is a summary of the why this change was made. Finally, we will load the text of a source mapped source from its source map’s sourcesContent property, if it exists. This property was added to source maps to enable dynamic source map creation, and to bundle your sources into the source map so that you don’t need to juggle extra files on your server. Frozen, sealed, and non-extensible objects are now visually distinguished in the debugger’s variables view. Also, when stepping out of a stack frame in the debugger, you will now see either the return value or the exception thrown (depending on why you are exiting the frame) in the variables view labeled <return> and <exception> respectively. You can now filter by types of requests in the network monitor. Want to see only requests for stylesheets? Or maybe only XHRs? We’ve got your back. On top of that, there are now total number of requests, file sizes, and response times listed in the bottom that update with you filters, so you can see just how many KBs (or even MBs) of images you are requesting on every page load. You can now control the profiler from your web app’s code base via console.profile() to start a new profile, and console.profileEnd() to end it. No more trimming your sample range, start and stop profiling in the exact places you want to from your code! That’s it for this episode. Keep on hacking the free web! I like computing, bicycles, hiphop, books, and pen plotters. My pronouns are he/him. I don’t know if it’s your goal but I’m looking forward to the day I don’t have to open Firebug anymore as it’s really slow compared to these new dev tools. Luckily, Firebug is also becoming faster. Will there be the ability to track websockets? 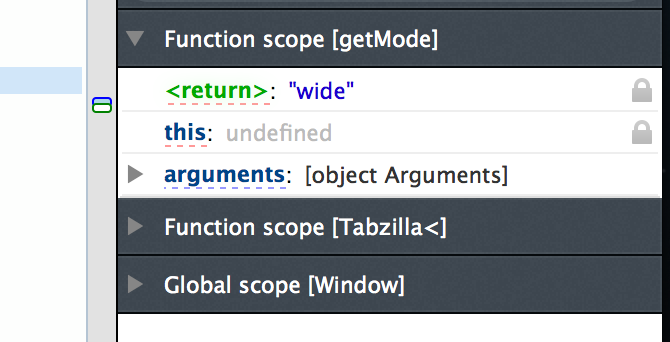 Is there an extra trick to get source maps in Firefox Developer Tools to work? I have this TypeScript project where I have added a debugger; statement in the code and generated the production JS and map file. I have checked the “Show original sources” item in the debugger configuration menu, but still the debugger enters the JS file when the debugger; statement is reached. I think this is a new bug we don’t have on file yet. What release are you on? Would you mind creating a small test case or steps to reproduce and filing a bug? 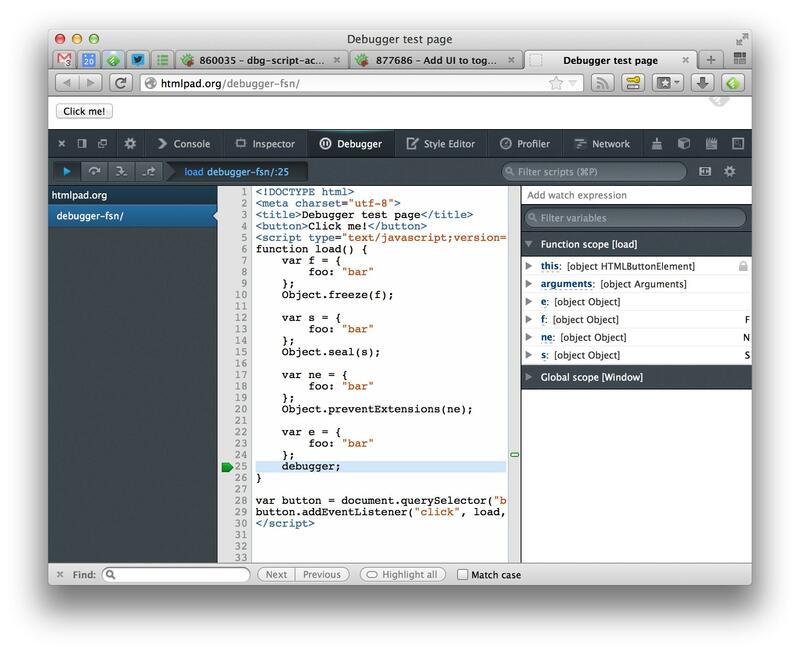 With more documented APIs, we could hope to see some of those handy Firebug-addons switch over to Firefox. Thanks for the great progress on these tools, looking forward to 23 & 24!